Treatment Improvement Protocol (TIP) Series, No. 59. Center for Substance Abuse Treatment (US). Rockville, MD: Substance Abuse and Mental Health Services Administration (US); 2014. Lisa is a 19-year-old White college student living in San Diego, CA, who was sent to treatment by her parents after failing her college classes and being placed on academic probation. While home on break earlier that year, her parents found pills in her room but let her return to school after she promised to stop using. The academic probation is only part of the reason her parents sent her to treatment. They were also concerned about her recent weight loss, as her older sister had previously struggled with bulimia. Lisa began using marijuana at age 15 with a cousin. In her first year of high school, she had difficulty fitting in. However, the next year, she became friendly with an electronic dance music clique that helped her define an identity for herself and introduced her to ecstasy (3,4-methylenedioxymethamphetamine, or MDMA), methamphetamine, and various hallucinogens, along with new ideas about politics, music, and art. She has since found similar friends at college and keeps in touch with several members of her high school clique. In treatment, Lisa tells her counselor that she has long felt neglected by her parents, who are too interested in material things. She sees her drug use and that of her friends as a rebellion against the materialistic attitudes of their parents. She also dismisses her family's cultural heritage, insisting that her parents only identify as Americans even though they are first-generation Americans with European backgrounds. She talks at length about ways to acquire and prepare relatively unknown hallucinogens, the best music to listen to while using, and how to evaluate the quality of marijuana. Lisa says that she doesn't believe she has a problem. She thinks that her failing grades reflect her lack of interest in college, which she says she is attending only because people expect it of her. When asked what she would rather be doing, she says she does not have any clearly defined goals and just wants to do “something with art or music.” Lisa points out that, unlike most of her classmates, she doesn't drink and has stopped doing addictive drugs like ecstasy and methamphetamine, which were responsible for her weight loss. She is convinced that she can continue to smoke pot and Salvia divinorum, which she notes “isn't even illegal,” and take other botanical hallucinogens. She is adamant about keeping her friends, who she says have been supportive of her and are not materialistic “sellouts” like her parents. This Treatment Improvement Protocol (TIP) emphasizes the concept that many subcultures exist within and across diverse ethnic and racial populations and cultures. Drug cultures are a formidable example—these are cultures that can influence the presentation of mental, substance use, and co-occurring disorders as well as prevention and treatment strategies and outcomes. Her counselor places a priority on connecting Lisa with other people her age who are in recovery. She asks a client who graduated from the program and is only a year older than Lisa to accompany her to Narcotics Anonymous (NA) meetings attended mostly by younger people in recovery. The counselor also encourages Lisa's friendships with other young people in the program. When Lisa complains about her parents' materialism and the materialism of mainstream culture, her counselor brings up the spiritual elements of mutual-help recovery groups and how they provide an alternative model for interacting with others. The counselor begins to help Lisa explore how her drug use may be an attempt to fill her unmet emotional and social needs and may hinder the development of her own interests, identity, and goals. Treatment providers should consider how cultural aspects of substance use reinforce substance use, substance use disorders, and relapses. Factors to note include clients' possible self-medication of psychological distress or mental disorders. Beyond specific biopsychosocial issues that contribute to the risk of substance-related disorders and the initiation and progression of use, counselors and treatment organizations must continually acquire knowledge about the ever-changing, diverse drug cultures in which client populations may participate and which reinforce the use of drugs and alcohol. Moreover, behavioral health service providers and program administrators need to translate this knowledge into clinical and administrative practices that address and counter the influence of these cultures within the treatment environment (e.g., by instituting policies that ban styles of dress that indicate affiliation with a particular drug culture). 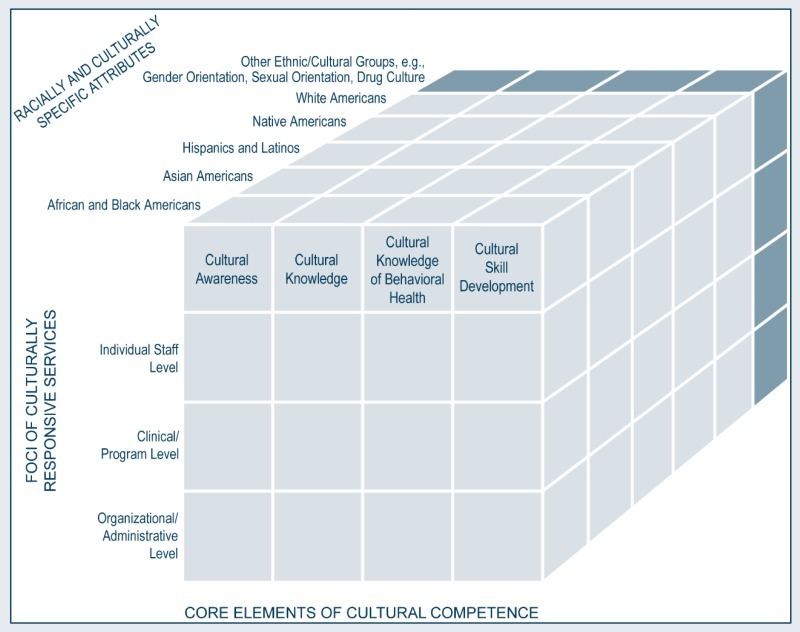 Adopting Sue's multidimensional model (2001) for developing cultural competence, this chapter identifies drug cultures as a domain that requires proficiency in clinical skills, programmatic development, and administrative practices. It explores the concept of drug cultures, the relationship between drug cultures and mainstream culture, the values and rituals of drug cultures, and how and why people value their participation in drug cultures. This chapter describes how counselors can determine a client's level of involvement in a drug culture, how they can help clients identify and develop alternatives to the drug cultures in which they participate, and the importance of assisting clients in developing a culture of recovery. Up to this point, this TIP has focused on cultures based on ethnicity, race, language, and national origin. The TIP looks primarily at those cultural groups because they are the major cultural forces that shape an individual's life and worldview. However, there are other types of cultural groups (sometimes referred to as subcultures) that are also organized around shared values, beliefs, customs, and traditions; these cultural groups can have, as their core organizing theme, such factors as sexuality, musical styles, political ideologies, and so on. For most clients in treatment for substance use disorders (including those who have a co-occurring mental disorder), the drug subculture will likely have affected their substance use and can affect their recovery; that is the primary rationale for the development of this unique chapter. Research literature in this topic area is considerably limited. Some people question whether a given drug culture is in fact a subculture, but many seem to have all the elements ascribed to a culture (see Chapter 1). A drug culture has its own history (pertaining to drug use) that is usually orally transmitted. It has certain shared values, beliefs, customs, and traditions, and it has its own rituals and behaviors that evolve over time. Members of a drug culture often share similar ways of dressing, socialization patterns, language, and style of communication. Some even develop a social hierarchy that gives different status to different members of the culture based on their roles within that culture (Jenkot 2008). As with other cultures, drug cultures are localized to some extent. For example, people who use methamphetamines in Hawaii and Missouri could share certain attitudes, but they will also exhibit regional differences. The text boxes in this chapter offer examples of the distinct values, languages, rituals, and types of artistic expression associated with particular drug cultures. Many subcultures exist outside mainstream society and thus are prone to fragmentation. A single subculture can split into three or four related subcultures over time. This is especially true of drug cultures, in which people use different substances, are from different locales, or have different socioeconomic statuses; they may also have very different cultural attitudes related to the use of substances. Bourgois and Schonberg (2007) described how ethnic and racial differences can affect the drug cultures of users of the same drugs to the point that even such things as injection practices can differ between Black and White heroin users in the same city. Exhibit 6-1 lists of some of the ways in which drug cultures can differ from one another. Differences in the physiological and psychological effects of drugs account for some differences among drug cultures. For example, the drug culture of people who use heroin is typically less frenetic than the drug culture involving methamphetamine use. However, other differences seem to be more clearly related to the historical development of the culture itself or to the effects of larger social forces. Cultural and socioeconomic components contributed to the rise in methamphetamine use among gay men on the West Coast (Reback 1997) and among Whites of lower socioeconomic status in rural Missouri (Topolski and Anderson-Harper 2004). However, in these two cases, the details of those change factors are quite different. In Missouri, the low cost and easy production of the drug influenced development of a methamphetamine drug culture. Missouri leads the nation in the number of methamphetamine labs seized by police; a disproportionately large number of seizures occur in rural areas (Carbone-Lopez et al. 2012; Topolski and Anderson-Harper 2004). The popularity of the drug among Whites could be linked to the historical development of the methamphetamine trade by White motorcycle gangs (Morgan and Beck 1997). On the other hand, most gay men who use the drug report having first used it at parties with the expectation of involvement in sexual activity (Hunt et al. 2006). In studies of gay men who used methamphetamine, the main reason for use was to heighten sexual experience (Halkitis et al. 2005; Kurtz 2005; Reback 1997). Morgan and Beck (1997) found that increased sexual activity was one reason why certain women and heterosexual men used methamphetamine, but it was not as important a reason as it was for gay men. Counselors and clinical supervisors must acquire knowledge about drug cultures represented within the client population. Drug cultures can change rapidly and vary across racial and ethnic groups, geographic areas, socioeconomic levels, and generations, so staying informed is challenging. Besides needing an understanding of current drug cultures (to help prevent infiltration of related behaviors and attitudes within the treatment environment), counselors also need to help clients understand how such cultures support use and pose dynamic relapse risks. Counselors can use this exercise to begin to educate clients about the influence of drug cultures and help them identify the specific behaviors, values, and attitudes that constitute their experience of using alcohol and drugs. It can be a helpful tool in improving clients' understanding of the reinforcing aspects of alcohol and drug use beyond physiological effects. In addition, this exercise can be used as a training tool in clinical supervision to help counselors understand the influence and potential reinforcing qualities of a drug culture among clients and within the treatment milieu. Materials needed: Diagram handout and pencils. Determine whether this exercise is more appropriate as an individual or group exercise. Assess the newness and variability of recovery within the group constellation. If several group members support recovery-related behavior, conducting this exercise may be a beneficial educational tool and means of intervention with clients who continue to identify mainly with their drug culture. Conversely, if most group members are new or have had difficulty accepting treatment or treatment guidelines, this exercise may be more aptly used as an individual tool. Attention: In group settings, strict parameters need to be established at the beginning of the session to ensure that the discussion remains centered on attitudes, values, and behaviors surrounding drug and alcohol use—not on specific techniques or procedures for using drugs or rituals surrounding intake or injection. Start the discussion by first presenting the idea that drug cultures exist—describing the main elements that constitute culture (refer to Chapter 1 or the categories identified in the “Drug Culture” diagram below). Next, provide examples of how drug culture can support continued use and relapse. Keep in mind that not all clients are engaged in a drug culture. Following the general introduction, review each block in the diagram and ask clients to provide examples related to their own use and involvement with drugs and alcohol. After discussing their examples, ask them to identify the most significant behaviors, attitudes, and values that reinforce their use (e.g., a feeling of acceptance or camaraderie). Counselors can redirect this general discussion to related topics—for example, by identifying behaviors, values, and attitudes likely to support recovery or by shifting from discussion to role-plays that will help clients address relapse risks associated with their drug culture and practice coping skills (e.g., assertiveness or refusal skills to counter the influence of others once they are discharged from the program or to address situations that arise during the course of treatment). What values are upheld or devalued in the group? What gender expectations exist surrounding drug use? Are there specific ways to dress that show allegiance to a specific substance or group? What are common attitudes toward others (nonusers, police, etc.)? This chapter aims to explain that people who use drugs participate in a drug culture, and further, that they value this participation. However, not all people who abuse substances are part of a drug culture. White (1996) draws attention to a set of individuals whom he calls “acultural addicts.” These people initiate and sustain their substance use in relative isolation from other people who use drugs. Examples of acultural addicts include the medical professional who does not have to use illegal drug networks to abuse prescription medication, or the older, middle-class individual who “pill shops” from multiple doctors and procures drugs for misuse from pharmacies. Although drug cultures typically play a greater role in the lives of people who use illicit drugs, people who use legal substances—such as alcohol—are also likely to participate in such a culture (Gordon et al. 2012). Drinking cultures can develop among heavy drinkers at a bar or a college fraternity or sorority house that works to encourage new people to use, supports high levels of continued or binge use, reinforces denial, and develops rituals and customary behaviors surrounding drinking. In this chapter, drug culture refers to cultures that evolve from drug and alcohol use. To some extent, subcultures define themselves in opposition to the mainstream culture. Subcultures may reject some, if not all, of the values and beliefs of the mainstream culture in favor of their own, and they will often adapt some elements of that culture in ways quite different from those originally intended (Hebdige 1991; Issitt 2009; Exhibit 6-2). Individuals often identify with subcultures—such as drug cultures—because they feel excluded from or unable to participate in mainstream society. The subculture provides an alternative source of social support and cultural activities, but those activities can run counter to the best interests of the individual. Many subcultures are neither harmful nor antisocial, but their focus is on the substance(s) of abuse, not on the people who participate in the culture or their well-being. Mainstream culture in the United States has historically frowned on most substance use and certainly substance abuse (Corrigan et al. 2009; White 1979, 1998). This can extend to legal substances such as alcohol or tobacco (including, in recent years, the increased prohibition against cigarette smoking in public spaces and its growing social unacceptability in private spaces). As a result, mainstream culture does not—for the most part—have an accepted role for most types of substance use, unlike many older cultures, which may accept use, for example, as part of specific religious rituals. Thus, people who experiment with drugs in the United States usually do so in highly marginalized social settings, which can contribute to the development of substance use disorders (Wilcox 1998). Individuals who are curious about substance use, particularly young people, are therefore more likely to become involved in a drug culture that encourages excessive use and experimentation with other, often stronger, substances (for a review of intervention strategies to reduce discrimination related to substance use disorders, see Livingston et al. 2012). When people who abuse substances are marginalized, they tend not to seek access to mainstream institutions that typically provide sociocultural support (Myers et al. 2009). This can result in even stronger bonding with the drug culture. A marginalized person's behavior is seen as abnormal even if he or she attempts to act differently, thus further reducing the chances of any attempt to change behavior (Cohen 1992). The drug culture enables its members to view substance use disorders as normal or even as status symbols. The disorder becomes a source of pride, and people may celebrate their drug-related identity with other members of the culture (Pearson and Bourgois 1995; White 1996). Social stigma also aids in the formation of oppositional values and beliefs that can promote unity among members of the drug culture (Exhibit 6-3). When people with substance use disorders experience discrimination, they are likely to delay entering treatment and can have less positive treatment outcomes (Fortney et al. 2004; Link et al. 1997; Semple et al. 2005). Discrimination can also increase denial and step up the individual's attempts to hide substance use (Mateu-Gelabert et al. 2005). The immorality that mainstream society attaches to substance use and abuse can unintentionally serve to strengthen individuals' ties with the drug culture and decrease the likelihood that they will seek treatment. The relationship between the drug and mainstream cultures is not unidirectional. Since the beginning of a definable drug culture, that culture has had an effect on mainstream cultural institutions, particularly through music (Exhibit 6-4), art, and literature. These connections can add significantly to the attraction a drug culture holds for some individuals (especially the young and those who pride themselves on being nonconformists) and create a greater risk for substance use escalating to abuse and relapse. To understand what an individual gains from participating in a drug culture, it is important first to examine some of the factors involved in substance use and the development of substance use disorders. Despite having differing theories about the root causes of substance use disorders, most researchers would agree that substance abuse is, to some extent, a learned behavior. Beginning with Becker's (1953) seminal work, research has shown that many commonly abused substances are not automatically experienced as pleasurable by people who use them for the first time (Fekjaer 1994). For instance, many people find the taste of alcoholic beverages disagreeable during their first experience with them, and they only learn to experience these effects as pleasurable over time. Expectations can also be important among people who use drugs; those who have greater expectancies of pleasure typically have a more intense and pleasurable experience. These expectancies may play a part in the development of substance use disorders (Fekjaer 1994; Leventhal and Schmitz 2006). Additionally, drug-seeking and other behaviors associated with substance use have a reinforcing effect beyond that of the actual drugs. Activities such as rituals of use (Exhibit 6-5), which make up part of the drug culture, provide a focus for those who use drugs when the drugs themselves are unavailable and help them shift attention away from problems they might otherwise need to face (Lende 2005). Drug cultures serve as an initiating force as well as a sustaining force for substance use and abuse (White 1996). As an initiating force, the culture provides a way for people new to drug use to learn what to expect and how to appreciate the experience of getting high. As White (1996) notes, the drug culture teaches the new user “how to recognize and enjoy drug effects” (p. 46). There are also practical matters involved in using substances (e.g., how much to take, how to ingest the substance for strongest effect) that people new to drug use may not know when they first begin to experiment with drugs. The skills needed to use some drugs can be quite complicated, as shown in Exhibit 6-6. The drug culture has an appeal all its own that promotes initiation into drug use. Stephens (1991) uses examples from a number of ethnographic studies to show how people can be as taken by the excitement of the drug culture as they are by the drug itself. Media portrayals, along with singer or music group autobiographies, that glamorize the drug lifestyle may increase its lure (Manning 2007; Oksanen 2012). In buying (and perhaps selling) drugs, individuals can find excitement that is missing in their lives. They can likewise find a sense of purpose they otherwise lack in the daily need to seek out and acquire drugs. In successfully navigating the difficulties of living as a person who uses drugs, they can gain approval from peers who use drugs and a feeling that they are successful at something. In some communities, participation in the drug trade—an aspect of a drug culture—is simply one of the few economic opportunities available and is a means of gaining the admiration and respect of peers (Bourgois 2003; Simon and Burns 1997). However, drug dealing as a source of status is not limited to economically deprived communities. In studying drug dealing among relatively affluent college students at a private college, Mohamed and Fritsvold (2006) found that the most important motives for dealing were ego gratification, status, and the desire to assume an outlaw image. Marginalized adolescents and young adults find drug cultures particularly appealing. Many individual, family, and social risk factors associated with adolescent substance abuse are also risk factors for youth involvement with a drug culture. Individual factors—such as feelings of alienation from society and a strong rejection of authority—can cause youth to look outside the traditional cultural institutions available to them (family, church, school, etc.) and instead seek acceptance in a subculture, such as a drug culture (Hebdige 1991; Moshier et al. 2012). Individual traits like sensation-seeking and poor impulse control, which can interfere with functioning in mainstream society, are often tolerated or can be freely expressed in a drug culture. Family involvement with drugs is a significant risk factor due to additional exposure to the drug lifestyle, as well as early learning of the values and behaviors (e.g., lying to cover for parents' illicit activities) associated with it (Haight et al. 2005). Social risk factors (e.g., rejection by peers, poverty, failure in school) can also increase young people's alienation from traditional cultural institutions. The need for social acceptance is a major reason many young people begin to use drugs, as social acceptance can be found with less effort within the drug culture. In addition to helping initiate drug use, drug cultures serve as sustaining forces. They support continued use and reinforce denial that a problem with alcohol or drugs exists. The importance of the drug culture to the person using drugs often increases with time as the person's association with it deepens (Moshier et al. 2012). White (1996) notes that as a person progresses from experimentation to abuse and/or dependence, he or she develops a more intense need to “seek for supports to sustain the drug relationship” (p. 9). In addition to gaining social sanction for their substance use, participants in the drug culture learn many skills that can help them avoid the pitfalls of the substance-abusing lifestyle and thus continue their use. They learn how to avoid arrest, how to get money to support their habit, and how to find a new supplier when necessary. The more an individual's needs are met within a drug culture, the harder it will be to leave that culture behind. White (1996) gives an example of a person who was initially attracted in youth to a drug culture because of a desire for social acceptance and then grew up within that culture. Through involvement in the drug culture, he was able to gain a measure of self-esteem, change his family dynamic, explore his sexuality, develop lasting friendships, and find a career path (albeit a criminal one). For this individual, who had so much of his life invested in the drug culture, it was as difficult to conceive of leaving that culture as it was to conceive of stopping his substance use. One major change that has occurred in drug cultures in recent years is the development of Internet communities organized around drug use (Gatson 2007a; Murguia et al. 2007) and drug use facilitation, including information on use, production, and sales (Bowker 2011; U.S. Department of Justice 2002). Such communities develop around Web sites or discussion boards where individuals can describe their drug-related experiences, find information on acquiring and using drugs, and discuss related issues ranging from musical interests to legal problems. Many of the Web sites where these online communities develop are originally created to lessen the negative consequences of substance use by informing people about various related legal and medical issues (Gatson 2007b; Murguia et al. 2007). As in other drug cultures, users of these Web sites and discussion boards develop their own language and values relating to drug use. Club drugs and hallucinogenics are the most often-discussed types of drugs, but online communities involve the discussion of all types of licit and illicit substances, including stimulants and opioids (Gatson 2007a; Murguia et al. 2007; Tackett-Gibson 2007). Counselors and clinical supervisors can help clients identify reinforcing aspects (besides physiological effects) of their drug and alcohol use and the losses associated with use, including unmet goals and dreams. The physiological, social, and emotional gains and losses that have transpired during their use (whether or not they associate these losses with their use) can serve as risks for relapse. This exercise works well as an interactive psychoeducational lecture for clients, as a training tool for counselors, and as a group counseling exercise. It can also be adapted for individual sessions. Materials needed: Group room with sufficient space to move around. Select an amenable client aware of the losses and consequences associated with his/her use. Later in the exercise, select other clients to give other group members a more direct experience. Divide the group in two. For large groups, select only 6 to 8 people for each side. Have each subgroup stand on opposite sides of the room facing each other. One group will represent the benefits of use; the other, losses associated with use (see diagram for room set-up). Rather than using the client's personal benefits and losses (at least initially), ask group members to brainstorm about their experiences that represent each side. Begin with the side of the room that represents “benefits of use” and ask everyone in the room to name some benefits. Then, assign a specific benefit to each person in the “benefits of use” group and create a one-line message for each (a first-person statement describing the benefit), asking the representative client to remember the line. For example, if the group named a benefit of use as immediate acceptance from others who use, assign this benefit to one person and create a message to capture it: “I make you feel like you belong,” or “We are family now.” Continue brainstorming until you have assigned six or more benefits. Next, go to the opposite group that represents the losses associated with use and begin to solicit losses from everyone in the room. Assign a loss to each person in the “loss” group, create a one-line message that coincides with each loss, and then ask an individual to remember each loss message (e.g., “I am the loss of your children,” “I am the loss of your self-respect,” “I am the loss of your health”). In addition, ask the group to name future goals and plans that were curtailed because of use. Assign these losses as well, following the same format (e.g., “I am the loss of a college degree,” “I am the loss of intimate relationships,” “I am the loss of belief in the future”). Note: If you run out of people, you can assign two roles to one person. At this point, the exercise can already be a powerful experience for many clients. Now, have the person who was originally selected as the client stand facing the “benefits of use” group. Have the client process what it is like to see the benefits of use. You can also have each person in the “benefits of use” group state his or her one-line message to help facilitate this process. Stand with the client as he or she moves to the “loss” group. Again, have the client stand and face this group while asking him or her what it is like to see the losses, including the losses related to goals and the future. Note: It is not important as an exercise to have benefits or losses specific only to this client. It is far better to gain a sample from the entire group so that everyone is involved and to maximize the exercise's effectiveness as a psychoeducational tool. After the client has stood in front of both groups, ask him or her to move back and forth between each group several times to see what emotional changes occur in experiencing each group. It is important to process this experience as a group. You can invite other members to switch out of their roles and stand in as clients to experience this exercise more directly. Clients are likely to see how seductive the “benefits of use” group can be and how this attraction can lead back to relapse. This exercise may also help clients connect with the losses associated with their use. At times, clients may gain awareness that the very losses associated with their use can also serve as a trigger for use as a means of self-medicating feelings. Allot sufficient time for this psychoeducational lecture—not only to demonstrate the benefits and losses associated with use, but also to enable the group to process their thoughts and feelings. Murguia et al. (2007) reported on a survey of adult (ages 18 and older) participants in one online community. The self-selected survey sample included 1,038 respondents, 80 percent of whom were from the United States. Respondents were likely to be young (90 percent were under 30), male (76 percent), White (92 percent), relatively affluent (58 percent had household incomes of $45,000 or more), employed (41 percent were employed full time; another 28 percent, part time), and/or in school (57 percent were attending school full or part time). According to the 2011 National Survey on Drug Use and Health, approximately 0.3 percent of individuals 12 years of age or older purchase prescription drugs through the Internet (SAMHSA, 2012b). Most people seek some kind of social affiliation; it is one aspect of life that gives meaning to day-to-day existence. Behavioral health service providers can better understand and help their clients if they have an understanding of the culture(s) with which they identify. This understanding can be even more important when addressing the role of drug culture in a client's life because, of all cultural affiliations, it is likely to be the one most intimately connected with his or her substance abuse. The drug culture is likely to have had a considerable influence on the client's behaviors related to substance use. The first step in understanding the role a drug culture plays in a client's life is to assess which drug culture(s) the client has been involved with and his or her level of involvement. There are no textbooks that can inform providers about the drug cultures in their areas, but counselors probably know quite a bit about them already, as they learn much about drug cultures through talking with their clients. Counselors who are themselves in recovery may be familiar with some clients' substance-using lifestyles and social environments or will have insight into how to explore the issue with clients. They can also educate their colleagues. Providers who have never personally abused substances can learn from recovered counselors as well as from their clients. However, asking a client point-blank about his or her involvement in a drug culture is likely to be answered with a blank stare. Instead, talking to clients about their relationships, daily activities and habits relating to substance use, values, and views of other people and the world can allow providers to develop a good sense of the meanings drug cultures hold for clients. To engage a client in treatment, understanding his or her relationship with a drug culture may be as important as understanding elements of that client's racial or ethnic identity. Clients are unlikely to self-identify as members of the drug culture in the same way that they would identify as an African American or Asian American, for example, but they can still be offended or distrustful if they think the provider or program does not understand how their lifestyle relates to their substance use. Affiliation with a drug culture is a source of client identity; the client's place in the drug culture can be important to his or her self-esteem. After the assessment and engagement stage, the provider's attitude toward the client's participation in a drug culture will be significantly different from his or her attitude toward the client's other cultural affiliations. As most providers already know (even if they do not use the term drug culture), if a client continues to be closely affiliated with the drug-using life, then he or she is more likely to relapse. The people, places, things, thoughts, and attitudes related to drug and/or alcohol use act as triggers to resume use of substances. Behavioral health service providers need to help their clients weaken and eventually eliminate their connections to the drug culture. White (1996) identifies an important issue to address during transition from engagement to treatment—in the process of engaging clients, providers help them identify how their connections to the drug culture prevent them from reaching their goals and how the loss of these connections would affect them if they chose to cut ties with the drug culture. One way to gain an understanding of a client's involvement in a specific drug culture is to learn about his or her daily routines and rituals. Keep in mind that there can be different routines on weekends or specific days of the week; ask about exceptions to the typical daily schedule. To elicit information about the client's daily activities, use a cue or anchor to initiate this exploration, such as a calendar highlighting each day of a week—Monday through Sunday. Placing the calendar in front of the client, ask him or her to describe a typical day, beginning with the time that he or she generally wakes up and building on the morning routines (e.g., “What does an average morning look like for you?”). Encourage the client to provide a specific account of his or her routine rather than a general response. Important information can be obtained by asking the client about feelings or reactions to daily activities as they unfold in the session. After completing an example of an entire day, ask the client if there are exceptions to this schedule that routinely occur on another day of the week or during the weekend. Once these are processed, it can be beneficial to ask what it was like for him or her to talk about these daily routines. A client can meet the psychosocial needs previously satisfied by the drug culture in a number of ways. Strengthening cultural identity can be a positive action for the client; in some cases, the client's family or cultural peers can serve as a replacement for involvement in the drug culture. This option is particularly helpful when the client's connection to a drug culture is relatively weak and his or her traditional culture is relatively strong. However, when this option is unavailable or insufficient, clinicians must focus on replacing the client's ties with the drug culture (or the culture of addiction) with new ties to a culture of recovery. To help clients break ties with drug cultures, programs need to challenge clients' continued involvement with elements of those cultures (e.g., style of dress, music, language, or communication patterns). This can occur through two basic processes: replacing the element with something new that is positively associated with a culture of recovery (e.g., replacing a marijuana leaf keychain with an NA keychain), and reframing something so that it is no longer associated with drug use or the drug culture (e.g., listening to music that was associated with the drug culture at a sober dance with others in recovery; White 1996). The process will depend on the nature of the cultural element. Just as people who are actively using or abusing substances bond over that common experience to create a drug culture that supports their continued substance use, people in recovery can participate in activities with others who are having similar experiences to build a culture of recovery. There is no single drug culture; likewise, there is no single culture of recovery. However, large international mutual-help organizations like Alcoholics Anonymous (AA) do represent the culture of recovery for many individuals (Exhibit 6-7). Even within such organizations, though, there is some cultural diversity; regional differences exist, for example, in meeting-related rituals or attitudes toward certain issues (e.g., use of prescribed psychotropic medication, approaches to spirituality). The planned TIP, Relapse Prevention and Recovery Promotion in Behavioral Health Services (SAMHSA planned e), provides more information on using mutual-help groups in treatment settings and in long-term recovery. It contains detailed information about potential recovery supports that behavioral health programs can use to foster cultures of recovery among clients and program graduates. Recovery from mental and substance use disorders is a process of change through which people improve their health and wellness, live in a self-directed manner, and work toward achieving their full potential. Most treatment programs try to foster a culture of recovery for their clients. Some modalities, with therapeutic communities being the lead example, focus on this issue as a primary treatment strategy. Even one-on-one outpatient treatment programs typically encourage attendance at mutual-help groups, such as AA, to meet sociocultural recovery needs. Most providers also recognize that clients need to replace the activities, beliefs, people, places, and things associated with substance abuse with new recovery-related associations—the central purpose of creating a culture of recovery. Teaching clients about the existence of drug cultures and their potential influence in clients' lives. Teaching clients about cultures of recovery and discussing how elements of the drug culture can be replaced by elements of a culture of recovery. Establishing clear boundaries for appropriate behavior (e.g., behavior that does not reflect drug cultures) in the program and consistently correcting behaviors that violate boundaries (e.g., wearing shirts depicting pot leaves; displaying gang-affiliated symbols, gestures, and tattoos). Working to shape a peer culture within the program so that longer-term clients and staff members can socialize new clients to a culture of recovery. Having regular assessments of clients and the entire program in which staff members and clients determine areas where work is needed to minimize cultural attitudes that can undermine treatment. Involving clients' families (when appropriate) in the treatment process so they can support clients' recovery as well as participate in their own healing process. White (1996) suggests that programs build linkages with mutual-help groups; include mutual-help meetings in their programs or provide access to community mutual-help meetings; and include mutual-help rituals, symbols, language, and values in treatment processes. Other activities that can improve integration into a recovery culture include SAMHSA's Recovery Community Services Program (http://www.samhsa.gov/grants/2011/ti_11_004.aspx), which was developed to provide and evaluate peer-based recovery support services, and Recovery Community Centers, which provide space for recovering people to socialize, organize, and develop a recovery culture (White and Kurtz 2006). Developing a culture of recovery involves connecting individuals back to the larger community and to their cultures of origin (Davidson et al. 2008). This can require efforts to educate the community about recovery as well (e.g., by promoting a recovery month in the community, hosting recovery walks or similar events, or offering outreach to community groups, such as churches or fraternal/benevolent societies). Programs that do not have a plan for creating a culture of recovery among clients risk their clients returning to the drug culture or holding on to elements of that culture because it meets their basic and social needs. In the worst case scenario, clients will recreate a drug culture among themselves within the program. In the best case, staff members will have a plan for creating a culture of recovery within their treatment population. Recovery is culturally based and influenced. Recovery involves individual, family, and community strengths and responsibility. More information on the Guiding Principles of Recovery is available at the SAMHSA Store (http://store.samhsa.gov/shin/content//PEP12-RECDEF/PEP12-RECDEF.pdf). Center for Substance Abuse Treatment (US). Improving Cultural Competence. Rockville, MD: Substance Abuse and Mental Health Services Administration (US); 2014. (Treatment Improvement Protocol (TIP) Series, No. 59.) 6, Drug Cultures and the Culture of Recovery.